I am a carnivore. And as a carnivore I strongly recommend that if you’re in the mood for a classic, no frills steak of epic proportions, that you come here. To The Peter Lugar Steakhouse. 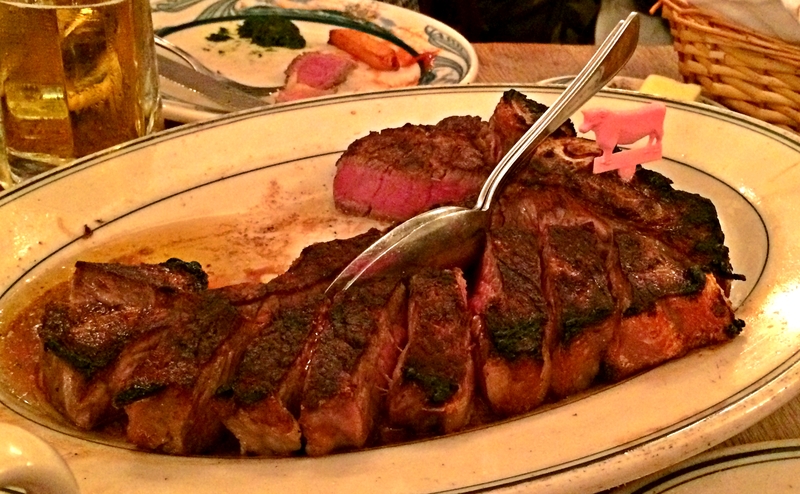 This restaurant has a long standing reputation as the place to go for legendary steaks– the Porterhouse to be exact. Established in 1887, it’s not a surprise that everything from meticulously picking the best cuts of meat straight from the freshest meat markets, to the broiling techniques and means of preparation, to the final presentation and serving of the meat itself is unparalleled. 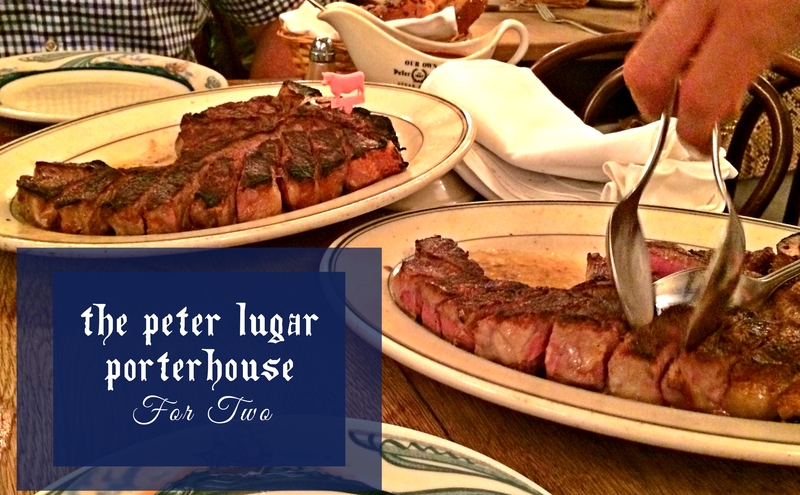 Peter Lugar only serves USDA prime beef. Just like they only take cash. The famous porterhouse is taken from a section of the short loin. Running down the center of the steak is the well known “T-bone” (named after the fact that the bone that looks like a T- mind blown- ammirite?) On one side is the New York strip, on the other side is the filet. These babies are then dry-aged to perfection, butchered to order and placed directly onto the broiler- only to be seasoned with with salt. The steak is flipped once during the broiling process and before the meat is placed on to the final serving plate, clarified butter is added to the platter. Only then is the meat sliced and the butter is allowed to join the natural juices of the meat in holy matrimony- as it should be. The meat is brought to your table on a tilted platter and served using two large metal spoons. Then it is devoured. In all of its flavorful, meaty, marbled, fatty and fabulous glory. While my bf, his awesome dad and I came for the meat, everything else was absolutely delicious as well! 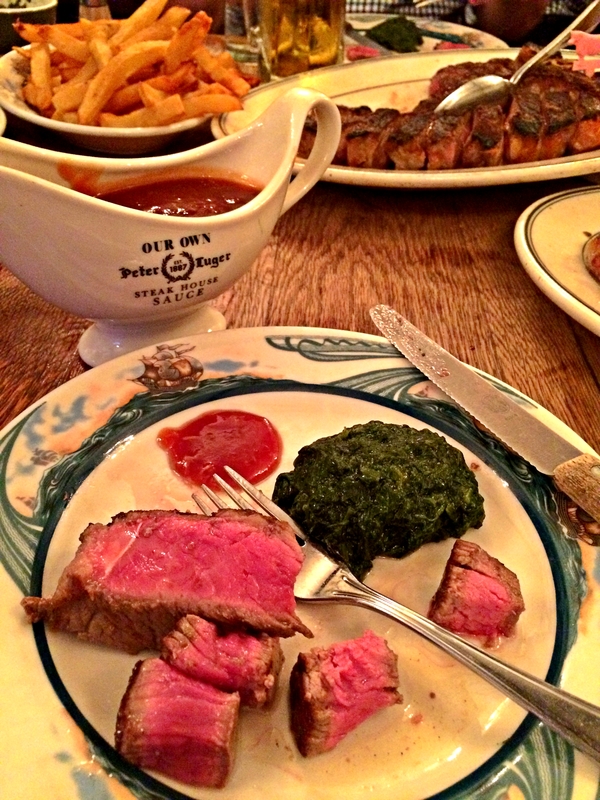 My favorite side was the creamed spinach, which was super rich in its own right. Definitely one of the tastiest “vegetable” based dished I’ve ever had. We also had a customary side of fries. For our appetizer, we ordered the Luger’s Sizzling Bacon, Extra Thick by the Slice. Which is insane. It’s bacon on steroids. BACON ON STEROIDS. So, yeah it was ridic. 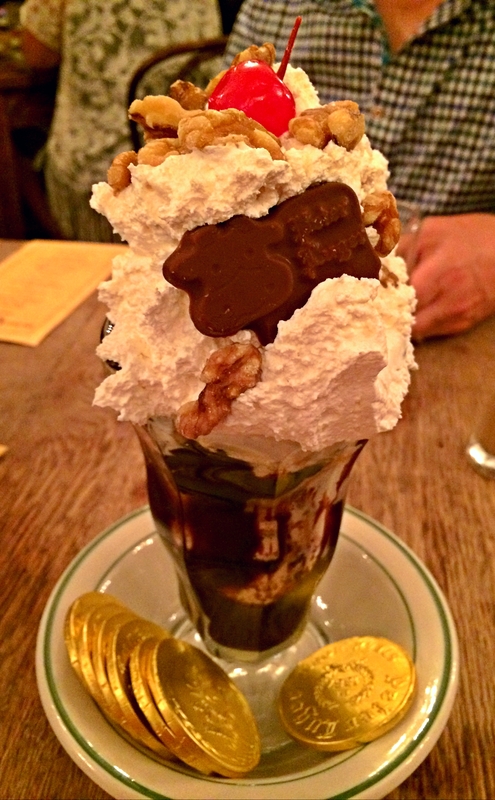 And as someone who never passes up dessert, no matter how stuffed, we split Luger’s Special “Holy Cow” Hot Fudge Sundae! I LOVE ICE CREAM SUNDAES. And get it? Holy cow?? To top off all the ice cream, hot fudge, whipped cream, walnuts (and the cherry of course,) they sent us on our way with pretty chocolate gold coins! Like the kind you’d get sometimes as a kid. yummm ill have to check this out! Been hearing about this place for years. Hopefully I’ll get there this year!